If you’re a follower of the HGTV series Fixer Upper (and who isn’t, right? ), you know DIY shiplap is trending for interior walls, to reflect that rustic farmhouse look. So what would Fixer Upper’s Joanna Gaines do with your TV? She'd go ahead and mount it on shiplap, of course! Mounting your TV on shiplap is essentially the same as with any other type of wood frame wall. The key is finding the studs in your wall, so your TV will be safe and secure. People often wonder if they can mount things on shiplap without having to find a stud because it's such a sturdy material. It's really best to find that stud. From there, it takes just a few steps to complete the project. 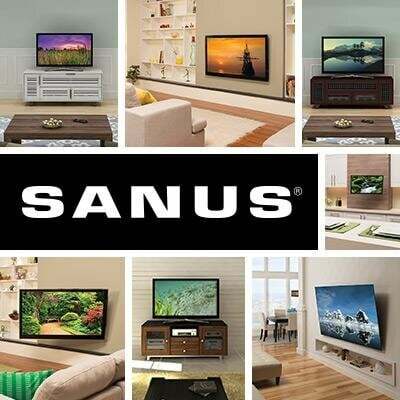 Your SANUS TV mount installs in three steps, comes with easy to follow instructions and all the hardware you need. Now that you know you can mount a flatscreen TV on shiplap, the question is how should you style it. The thing about shiplap is that it comes in several styles. And in many older homes around the country, especially farmhouses, shiplap was used on the interior for added insulation. Whether you’re working with an existing wall or planning a DIY shiplap project, we recommend simplicity. Simple design is easier on the eyes, and also lets the shiplap be the star of room. Uncluttered living space is more welcoming. It feels more comfortable – especially in a room where you want to relax and watch TV or a movie. Wall-mounting your TV reduces visual clutter, frees up surface space in your room, and greatly improves your viewing experience. 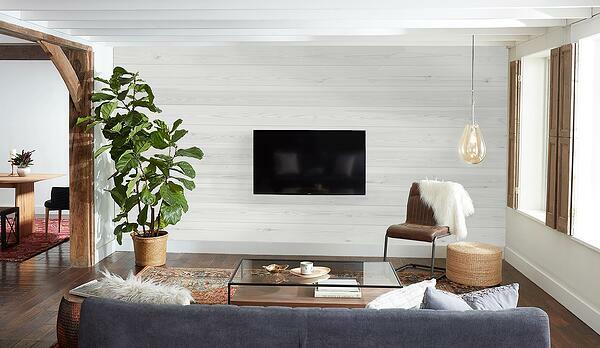 Shiplap gives walls a strong linear look and subtle texture that beautifully complement the simple lines and smooth surfaces of a flatscreen TV. You can leave the shiplap au naturel or stain it. Of course, Joanna would probably recommend whitewashing it to achieve a rustic farmhouse look or painting it white because white works with everything. White makes your room’s color accents really pop, and it can highlight your TV as the room’s focal point. You don’t want wires and cables hanging down below your TV where they will detract from the shiplap’s clean lines. But what should you do with them? An in-wall cable management system like the SANUS ELM806 is a good way to go, and it can be used even with shiplap on the wall.The cable management system routes all the cables and wires behind the wall, and the snap connectors make installation a snap, even for novice DIY’ers. Mounting your TV directly on shiplap is just one idea. But if you really want a custom look, you could use shiplap to create a frame for your TV or to construct simple shelving under it or around it. To complete the room’s coordinated, built-in look, you could add shiplap wainscoting on the lower walls. 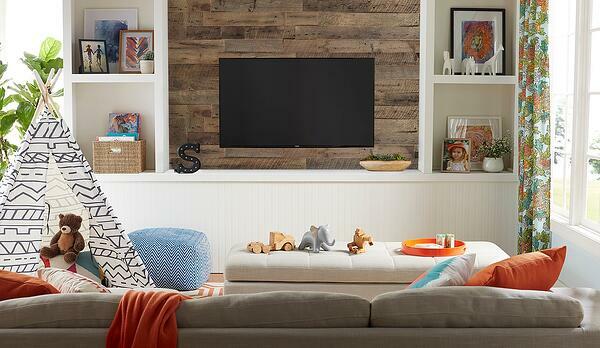 One thing’s for sure – if you’re planning a DIY shiplap project, mounting your TV will fit in beautifully.